We’re standing in the yard of a Wellfleet summer cottage, where he estimates the owner, Steve Daniels, planted this tree about 50 years ago. “ I don’t know if you remember 8th grade science, but these are what they call compound pinnate leaves. They have the v-nation of a feather; they have a central vein, and then parallel ones going off maybe like a beech tree but they’re on fronds of maybe 6-7 on a side and then a central one. So that’s one way to recognize them,” Richard said. They look a lot like locusts. Black walnuts are actually in the hickory family, and grow best in sandy, well drained soil like we have on the Cape. Their natural range extends from Western Vermont and Massachusetts all the way west to southern Ontario, down to central Texas, and then east into Georgia and up the coast. They’re not native here, but the tree Daniels planted is doing well. “These are black walnuts off the tree, very citric smell I find. The shell casings inside these husks are really thick, much thicker than a California walnut,” Richard said. I asked him what the process was like for getting them open. The crusty outer part Bailey is talking about is the husk. 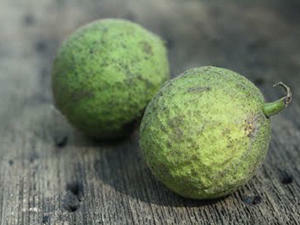 While the black walnuts are on the tree, it’s a smooth, green case, similar to the flesh that surrounds a chestnut. Once the nuts fall to the ground, the husks start to darken. And when you go to take them off, they ooze a dark black juice. Beneath the husk is the hard inner shell, the kind you see for sale in bags of mixed nuts that people get around the holidays, to open with nutcrackers. “Once the nuts are out, I just let them dry and they seem to keep for a year or two. I think opening the nuts is the more challenging part. The shell part I usually throw them in the oven at a low temperature of 350 maybe for 15 or 20 minutes and that seems to make the inner shell more brittle so you can smash it with a heavy hammer on a rock,” Richard said. You get about a cup of nutmeats for every 2 pounds of unshelled black walnuts. It’s a lot of work, but Richard Bailey says the taste of black walnuts makes it worth it. “It’s a crazy comparison but it’s sort of like the difference between chicken and a wild duck. Black walnuts are just a little more flavorful than California walnuts. But they’re very comparable,” he said. Some people describe the flavor as strong, musty, and even smoky. My great-grandmother had a recipe for black walnut cake, and I pulled out the recipe and baked one for the first time the other day. It was amazing: rich, nutty, and sweet. You can find a recipe for Maryland Black Walnut Cake at Elspeth's blog. This piece first aired in 2011.